Designed to cut, all S Family Rock models offer the volume and projection when you need it most. Larger diameters = more cut and more volume. Zildjian kitted together 14" Rock hi-hats, 18", and 20" Rock crashes, and a 22" Rock ride to give you all the power to plow through the loudest of rock gigs, especially when more projection is needed. With a name like "Rock," this cymbal set won't let you down. Overall: Bought without hearing them and am shocked at the great sound. Best deal out there, a 22” ride and larger crashes with an exceptional tone! The best part is the amazing ride and hi-hats, they sound amazing. I am also happy with the crashes, I have grown to love larger diameter, I get great cut without killing them. The case is also a added bonus, zZounds had the best price in this set, so get it! "Zildjian SROCKXL S Series Cymbal Pack"
Overall: By far the absolute best value of Zildjian cymbals available. 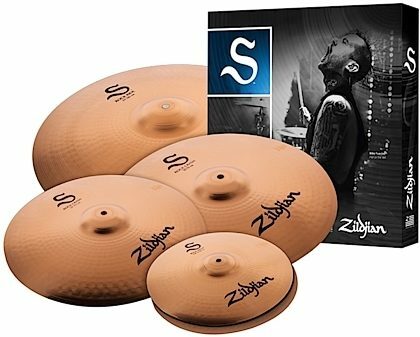 I've listened very closely to all of the Zildjian lines, and for the money and sound, the S ROCK series is pretty hard to beat. I love them, they're great!